Each year, Penn Libraries holds a Pecha Kucha event as the culmination of the year’s Public Services Forum meetings. The event provides librarians a chance to share research, past projects, or new ideas for the upcoming year. This year, I decided to do my 20×20 presentation on my experiences with video tools for flipping the classroom over the past year at WIC. In particular, I focused on our work with educators at the Penn Language Center (PLC) in conjunction with their Certificate in Instructional Technologies and Online Learning. After working with PLC language educators over the past year, we also enjoyed viewing the outcomes of their projects in May at the PLC Annual Teaching and Showcase Award Program. Such projects have inspired us to host new events, like Scholarship, De-Printed, and offer new workshops on flipped classroom and other audio/video tools for showcasing online teaching and research. It’s also tempted us to look back on the various video projects we have participated in with language classes and document these in a publication that we’re working on for the CALICO Book Series. Please take a look at my presentation above to see our adventures this past year in flipped classroom tools at WIC (spoiler alert – my Prezi recording goes over the strict 5 minutes for Pecha Kucha!). 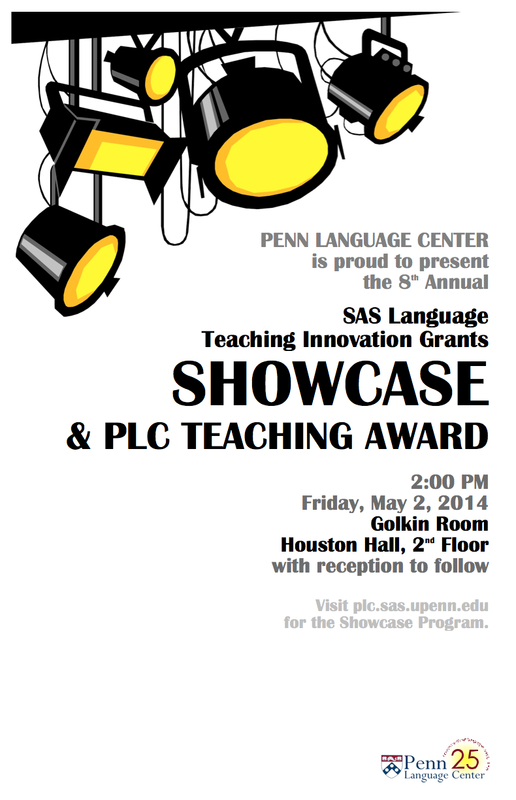 On May 2, a couple of us from WIC attended the Penn Language Center’s 8th Annual Showcase and Teaching Award Program. Each year, language educators in SAS apply to the PLC for SAS Language Teaching Innovation Grants to enhance course content and, therefore, students’ language-learning experiences in the classroom. The results of these grants were showcased at Friday’s event, and a panel of judges chose two projects as this year’s winners.